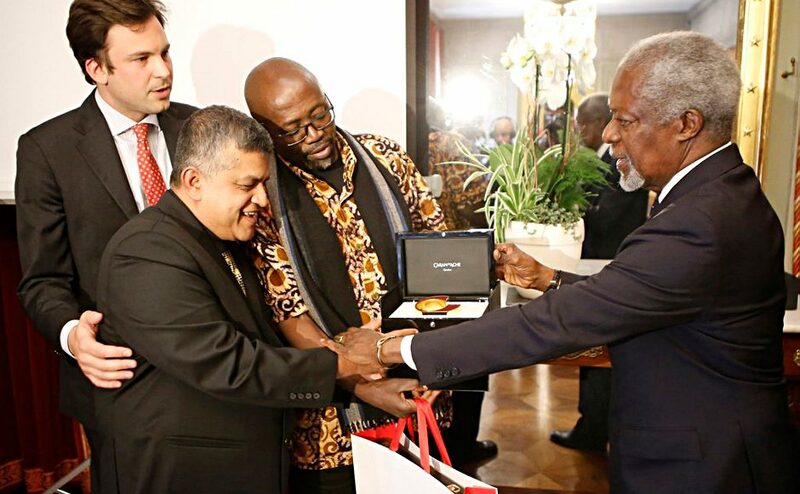 (r. to l.) Former UN Secretary General, Koffi Annan joined by cartoonists Godfrey Mwampembwa (GADO) and Zulkiflee Anwar Ul-Haque aka Zunar in Geneva yesterday in celebration of the World Press Freedom Day. The celebrated Kenyan cartoonist Gado real name Godfrey Mwampembwa, is the winner of this year International Editorial Cartoons Prize also known as the Cartooning For Peace Award, awarded on 3rd May during the World Press Freedom Day, in Geneva Switzerland. Joining him on the award was the Malaysian cartoonist Zulkiflee Anwar Ul-Haque also known as Zunar. The two satirical cartoonists are embattled in their home countries of Kenya and Malaysia, for drawing politically provoking caricatures and have since left to work elsewhere. According to the Community to Protect Journalists (CPJ), Gado has been a prominent and quick-witted observer of the political scene in East Africa. This quickly changed last month, when Gado, was told his contract at the Nation, would not be renewed. Speaking during the awarding ceremony in Geneva, former UN Secretary General Koffi Annan recounted challenges that face most media practitioners in their work. “They confront us with our responsibility to preserve the freedom of expression,” said Annan. Kofi Annan is the Honorary President of the Swiss Foundation Cartooning for Peace (Drawing for Peace), which awarded the prize this year for the third time. In his caricatures Gado denounces corruption among African politicians and the impunity displayed by some at the International Criminal Court (ICC). During a UN debate held at the Geneva event, Mwampembwa described the intricate and troubling relationship between the media and authorities in many African countries. Gado has since moved to Germany’s International Media Company -Deutsche Welle (DW) – Swahili. Gado, is the most syndicated political cartoonist in East and Central Africa, and for over two decades a contributor to the Daily Nation (Kenya), New African (U.K.), Courrier International (France), Sunday Tribune (South Africa), Le Monde, Washington Times, Des Standard, and Japan Times among other renowned publications. The International Caricature prize is awarded every two years, the event was followed by the official opening of an exhibition showcasing the work of the winning artists and other cartoonists Geneva, viewed along that of Quai Wilson.